Vienna, the capital of Austria is a very popular city trip destination in Europe. And for good reasons. The so-called “city of Dreams” has a lot to offer its visitors. There are so many tourist attractions in Vienna that you just don’t want to miss out on. 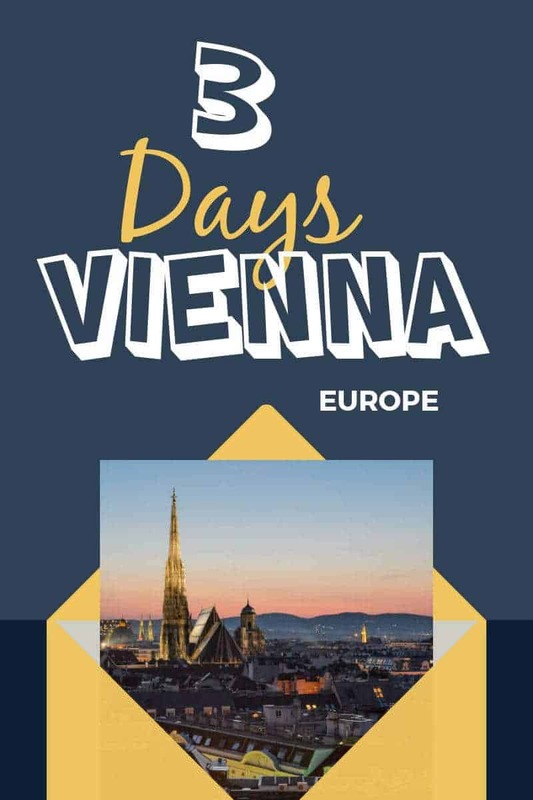 Therefore we’ve created this Vienna 3 day itinerary packed with all the must-see places. Are you just spending a weekend in Vienna? You can easily adjust this Vienna travel guide to a 2-day itinerary. 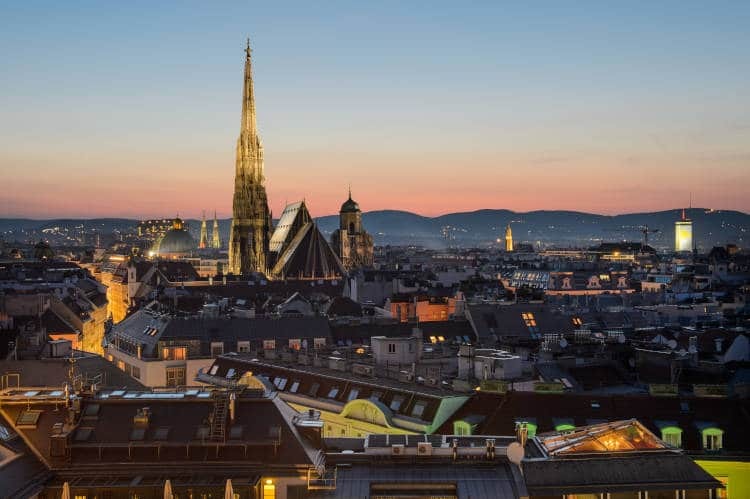 Tip: Before you start exploring all the top attractions of Vienna, stop at a U-Bahn point anywhere in the city and buy a 72 hours Vienna ticket. With this ticket, you can use any form of public transportation within the city. Anno 2019 the ticket costs 17.5 €. You just have to validate the ticket before usage and you are ready to go for the next 3 days. Your first day in Vienna probably won’t be a full day as a part of it will be spent on traveling to Vienna. That’s why this day is all about settling in and have a chill afternoon and a fun evening. Austrian artist and architect Friedrich Stowasser (alias Hundertwasser) created the Hundertwasser Haus that attracts visitors from all over the world. This quirky and colorful building really stands out from its surroundings. 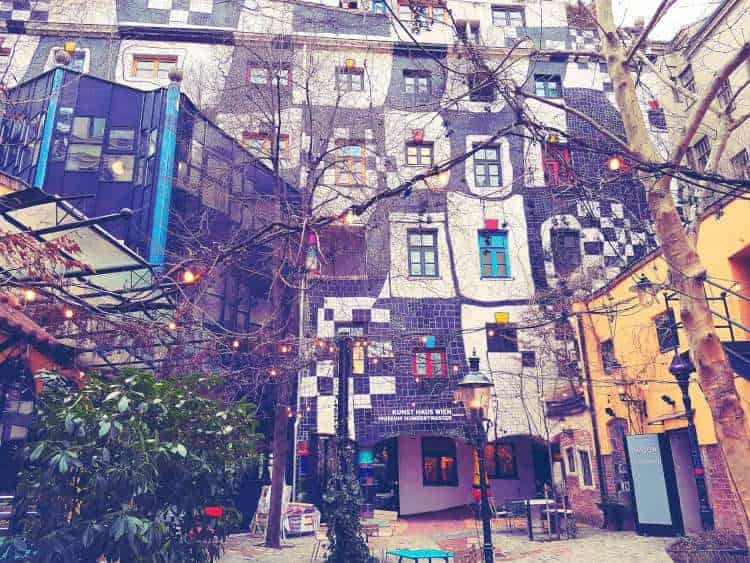 Unfortunately, the Hundertwasser house is only accessible for its residents but you can get some amazing shots from the outside! Don’t worry, Mr. Hundertwasser did think of us and all the other admirers of his artwork. So, he created the Hundertwasser Village right in front of it. It is a little village recreated in his typical style filled with cozy shops and a central square with a bar. A very cool place to have a drink and just stroll around. Do you like Hundertwasser’s style and are you intrigued to see some more of his creations? Then head over to Kunst Haus Wien. It is just a short stroll away from the Hundertwasser Village and you will surely recognize it by its style. Here you can visit a permanent exhibition of Friedrichs artwork as well as changing exhibitions of a variety of contemporary artists. 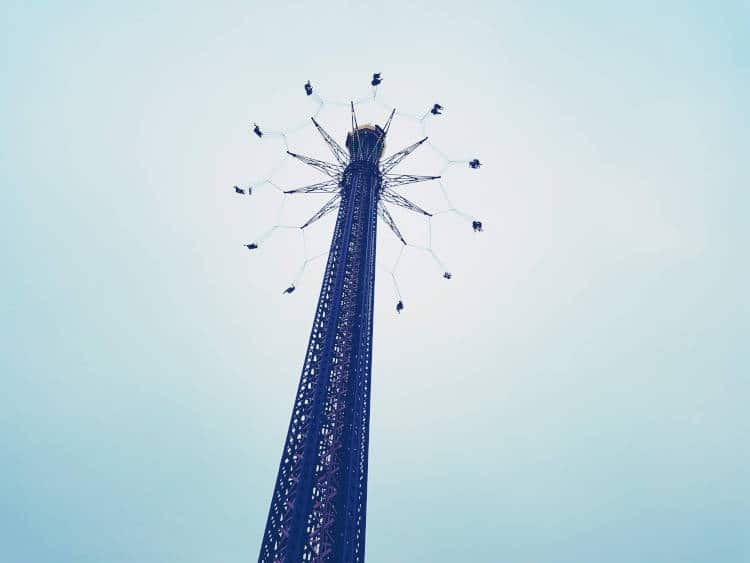 Prater Park has a bit of everything! At one side you have the green side of the park, which is, surprise surprise: a city park! This former imperial hunting ground of the Habsburgs now is a popular public park. It is an oasis of green in the Leopold district where a lot of Viennese come to relax and enjoy their free time. Tip: Take a ride on the Liliputbahn. You get to see a piece of the Park and it’s just fun! The other side is the amusement side of Prater Park with its most noticeable feature the Giant Ferris Wheel. From March 15th until October you can amuse yourself with all kinds of attractions like a ghost house, a mirror house, and carousels. Of course, there are a lot of possibilities to eat and drink too. The Ferris Wheel is open all year round and offers you fantastic views of the city. The amusement park is a fantastic way to end your first day in Vienna. Find a nice place to get a good Viennese breakfast. The city has plenty of excellent restaurants so fill up that tummy because you are going to need the energy! Day 2 of this Vienna itinerary is packed with top places to visit in Austria’s capital. Belvedere slot is a grandiose Palace in the Baroque style that now is home to a treasured art collection. At the Belvedere, art lovers can admire the work of famous artists such as Klimt and Schiele. As impressive as the Belvedere slot might be, the surrounding gardens of the Belvedere are a work of art on its own. To capture that perfect mirrored shot of the Belvedere slot you have to be outside in the Garden. There is a big pond placed strategically in front of the building which reflects its grandeur beautifully on windless days. Take your time to get lunch. 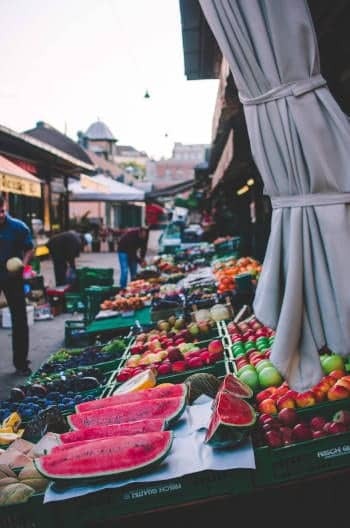 Getting to know a city/ country is partly getting to know its food. Vienna is famous for its Schnitzel and you can find it all over town. Personally, we are not a fan of breaded food so I must admit we didn’t try it. We do love chocolate cake though! That’s why we had the iconic Sachertorte for dessert and it did not disappoint! It is a must-try dessert when eating in Vienna. The Sachertorte is a piece of chocolate cake with some layers of apricot marmalade in between. Njammie. A free guided walking tour is a perfect way to get to know a city and we especially enjoyed this one! Our guide Wolfgang really knew his stuff! He was very funny and we had the best time exploring Vienna’s top attractions with him and the group. Look for a person holding a green umbrella. The tour is free but it is normal to tip the guide after the tour. You are free to give what you like. If you would rather discover the city on your own than go for it! 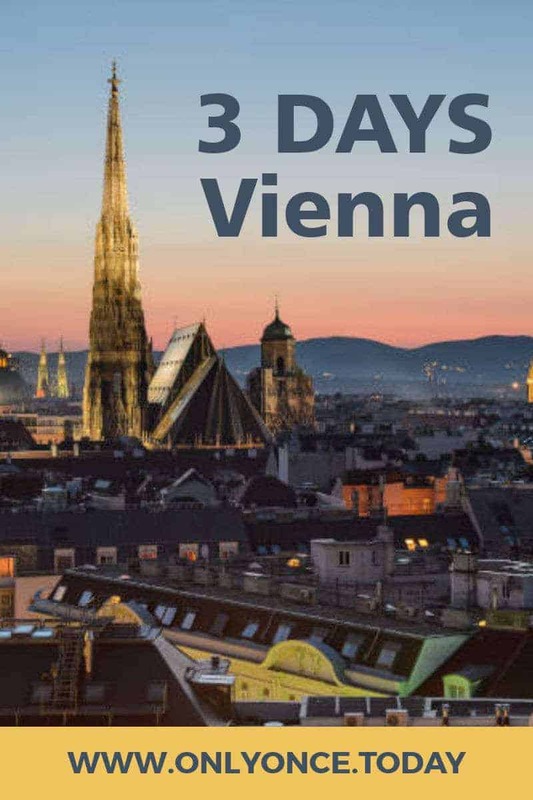 The next stops on this Vienna itinerary are all very close to each other. 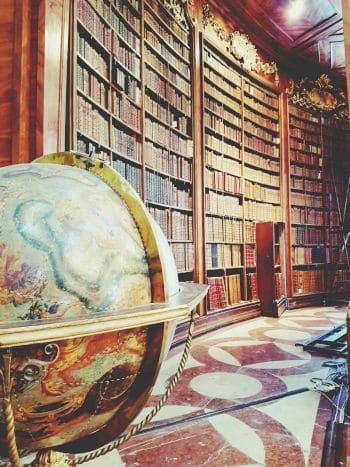 With the guide, you get a bit of historical information and some fun facts about Vienna and life in the city at the time of Mozart, Freud and the reign of the Habsburgs. You don’t have the time to visit the inside of any of these stops. So if you want to do that, go on your own. If you like art and history than this museum is a must. It is located on the Albertinaplatz in a part of the former Imperial Residential Palace. At the Albertina, you can admire a valuable art collection from artists such as Renoir, Degas, Monet and many more. Tip: Take the escalator to get some cool shots of the Opera that lies right across the street. 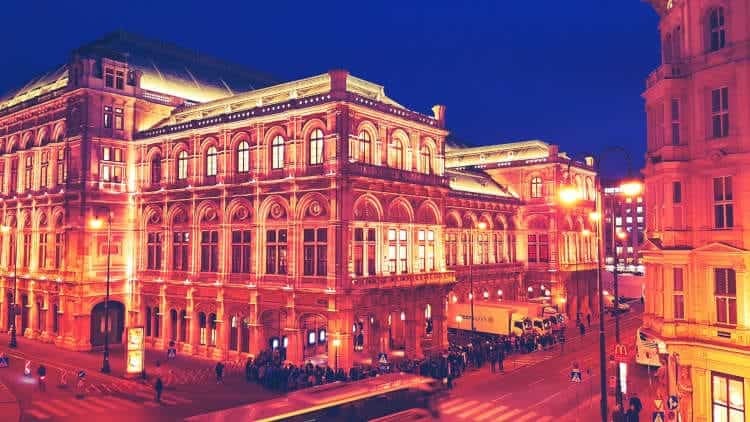 The Vienna State Opera is world famous! You can enjoy one of the many top productions of Ballet or Opera there almost every day of the week. If you would like to experience a show than you must reserve your tickets. It was possible to buy your tickets for the opera at the end of the walking tour. They offered A-tickets at a discount for B-ticket prices. One of the largest Palace constructions in the world can be found in the city center of Vienna: Hofburg. This imperial Castle that belonged to the Habsburgs rulers of Austria since the 13th century is an expression of class and wealth. It was the Winter Palace of the emperor and his family and nowadays it is open for the public. You can visit different museums and collections here, like the Sisi Museum and the Royal Apartments of emperor Franz Jozef and Empress Sisi. 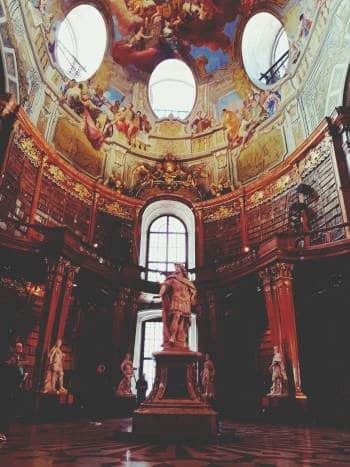 This is one of the most beautiful libraries I have ever seen. We didn’t have time to go in while we were on the walking tour, but we went to visit it on our last day, right before heading home. The entrance was 8€ and you will need only half an hour, 1 hour tops. Also situated on the Ringstrasse, close to the Hofburg Palace you can find the Burggarten with the iconic Palmenhaus where you can go to have a drink. The Museum Quarter is a popular meeting point for locals and tourists alike. A plethora of museums is gathered here in the former Imperial Stables. 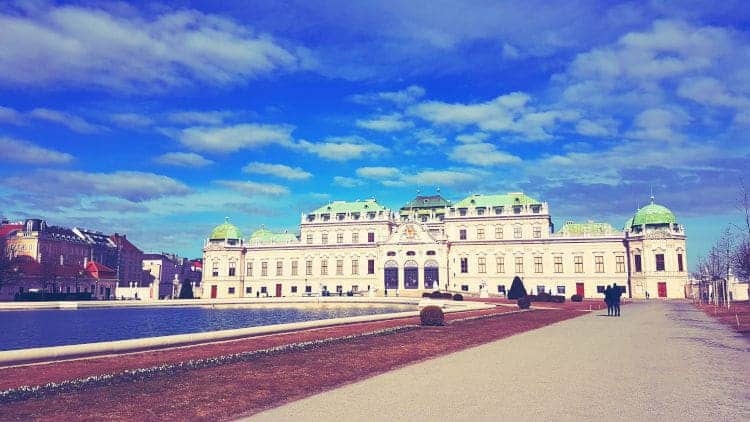 Some of the most popular museums in Vienna you can find right here. Such as the Leopold Museum, the Natural History Museum and mirrored to it the Art History Museum. The area has also a lot of bars and restaurants and during summer there are placed some big canapes outside so it’s much nicer to enjoy the sun and hang around. If you want to go shopping in Vienna then Graben is the place to be. Graben is a big shopping street located in the middle of all the top sights that Vienna has to offer. 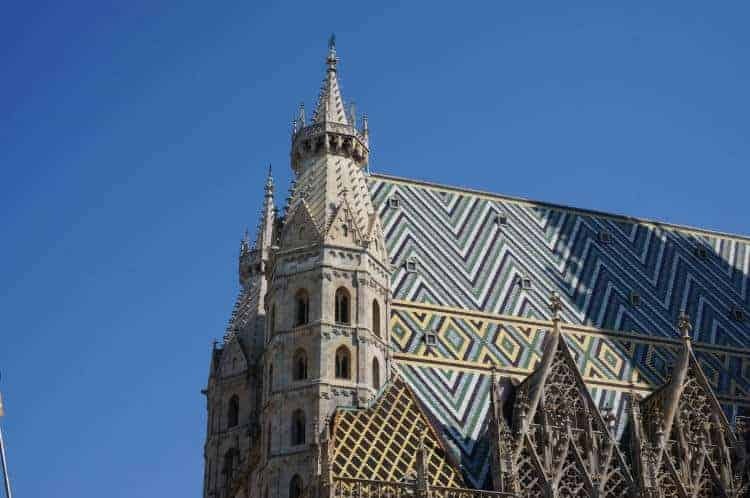 On the Stephansplatz you can find this original gothic Cathedral with its colorful roof. Climb the 343 steps of the highest of the 4 towers and enjoy some of the best views of Vienna! You can also climb the towers when it is already dark outside so you can see all the city lights shimmering brightly. It’s picture time baby! We had a great dinner at Vapiano. This is a very affordable and popular restaurant where you can choose out of a large variety of salads, pizza, pasta, risotto, and lasagna dishes. They work with a very fun concept. You get a card when you enter the restaurant. Then you head over to the cooks where you place your order. They prepare your dish right in front of you. The total amount you owe is placed on the card you received. Choose a seat and start eating! Every table has some fresh basil and herbs you can add yourself, there are also some yummy oils you can add to your liking. Before you leave you pass the register and all is taking care of. The Rathausplatz is always worth checking out. Most of the time there is something going on here. Depending on what time of the year it is, you will most likely have a good time here. 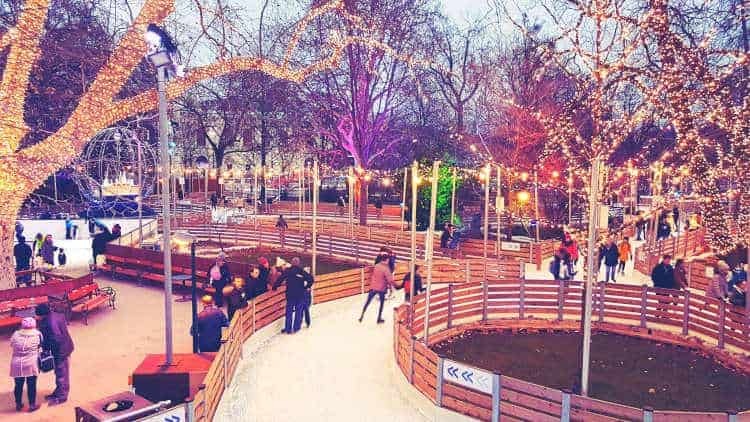 We visited at the end of February and the whole area was transformed into a giant ice rink. There was music playing, lots of cozy lights everywhere and many food stalls so you will not get hungry. Other parts of the year they organize for example a Christmas market here or an open air cinema. While Hofburg Palace was the winter residence of the Habsburgs, Schönbrunn Palace was the summer residence of the royal family. It is now a UNESCO world heritage site. 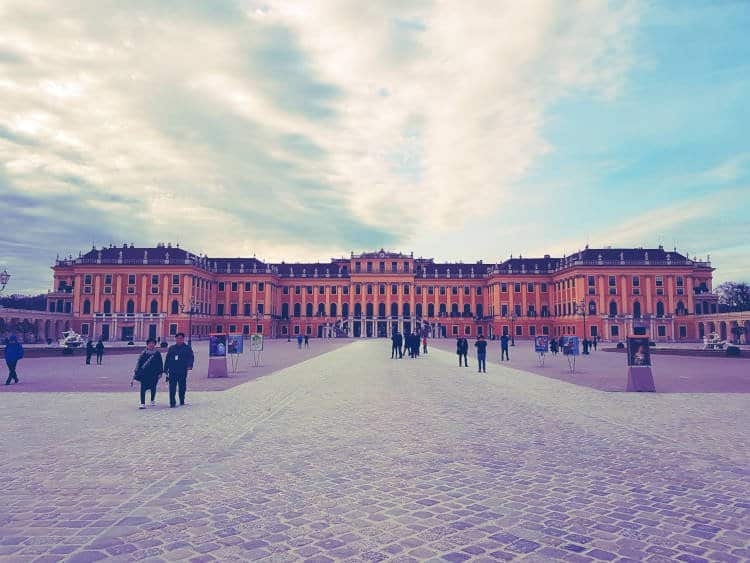 We bought a winter ticket which included a grand tour of the Schönbrunn Palace, entrance to the Zoo and entrance to the Palm Haus and Desert House. Before noon you can do the grand tour of the Palace. You go from room to room with audio guidance that you can control. Unfortunately, it was closed while we were there. Otherwise, you could give it a try or you can watch people get lost in it from upon a stand. 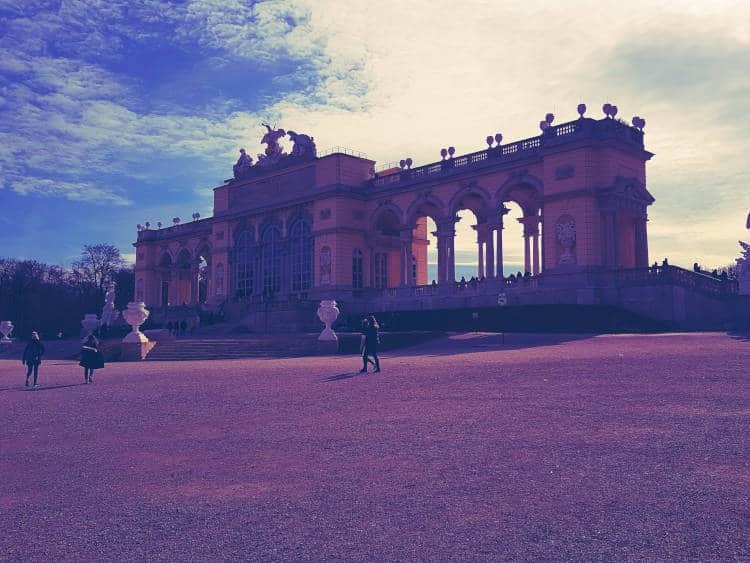 At the back of the Schönbrunn Palace, you look straight upon the Gloriette. Located upon the hill it is a magnificent building that has an observation terrace on top. Now it is a café, but at the Gloriette you can take stunning pictures of Vienna, the Palace, and its surroundings. There are a few spots where you can eat at the Schönbrunn Palace. First of all, I am not a big fan of zoos. It always makes me sad to see these animals living in captivity. But on the other hand, this zoo houses some animals that are close to extinction and takes really good care of them. If it weren’t for the Zoo they might not even be alive today. 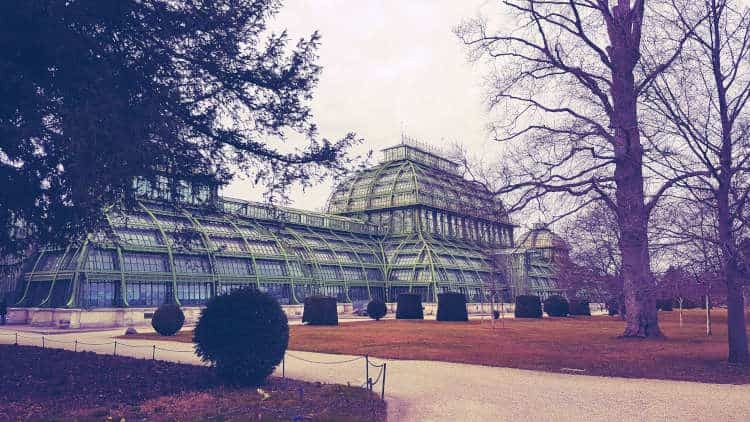 This is the largest Palm House in Europe. You can stroll around the house on paths that lead you through all different kind of tropical plants and flowers. Come to rest on one of the benches and imagine yourself being in a faraway lush country. It’s really worth a visit. The desert house is created to give you a glimpse of the conditions of life in the desert. 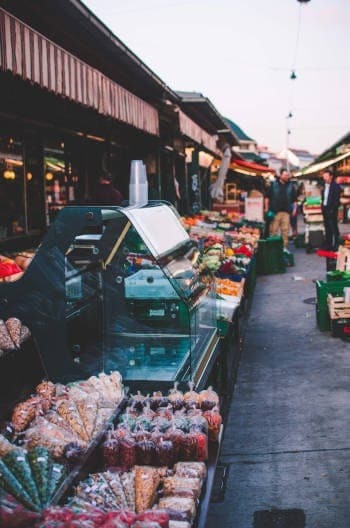 The Naschmarkt is a popular fruit and vegetables market in Vienna. It is open until 19.30 PM. You can find numerous nice restaurants and bars here to enjoy your dinner. So, that is our itinerary for 3 days in Vienna. We hope you will enjoy your city trip as much as we did. We visited Vienna in February 2019 and we are already thinking about going back this Summer. Hi! I am Lobke . I am a passionate traveler, photographer, and an aspiring writer. My mission is to discover the world and understand different cultures. I want to take you on my quest to broaden my horizon.